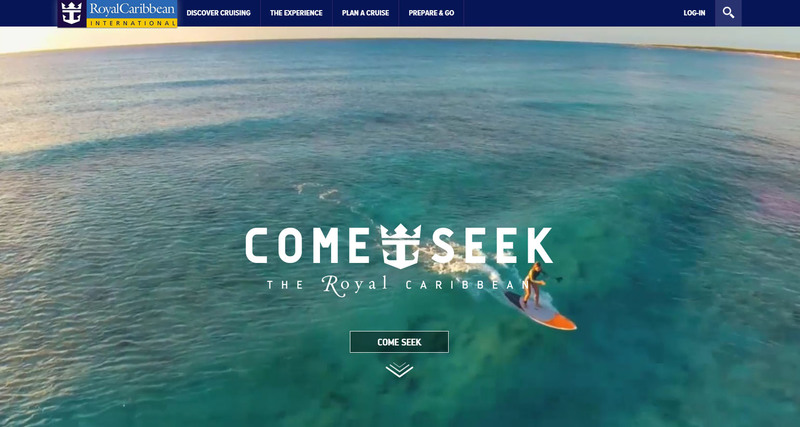 Today marks the official launch of Royal Caribbean's new marketing campaign, "Come Seek" and already its website is showing off the new branding. A new mini-site launched today that reinforces the three main messages of the campaign: "You are not a tourist", "This is not a cruise" and "This is not the Caribbean". The site also shows off still and moving imagery that focuses on the one-of-a-kind experiences a Royal Caribbean cruise can offer. The "Come Seek" campaign is aimed at people that have never taken a cruise before and may have never even considered one. Royal Caribbean is specifically going after Millenials and those that have misconceptions about what a cruise vacation is. In addition, Royal Caribbean re-branded its Twitter and Facebook designs to match the "Come Seek" motif. With the official launch of the "Come Seek" campaign today, Royal Caribbean will be also running ads on popular TV shows, such as the "Late Show" with Stephen Colbert, the "Tonight Show" starring Jimmy Fallon and also the reality show, "The Voice." The first salvo of advertising will be quick five-second ads that are meant to pique the interest of a viewer, which will be followed up by more traditional 30-second spots with similar music and theme. Ads will be seen on ABC, NBC, CBS, ESPN, Food Network, HGTV, Travel Channel, Bravo and TBS. Later in the campaign, Royal Caribbean will launch “Come Seek Live” - a first of its kind crowd-sourced Periscope activation originating from a Royal Caribbean ship and streamed onto a series of animated billboards in major metro areas. Is the new "Come Seek" campaign your favorite Royal Caribbean marketing campaign? Tell us in the comments!